Emily Ratajkowski, the renowned American model and actress was seen wearing a beautiful, flared, floral print, ankle length dress, for what looked like a photoshoot. She completed her look with hair tied in a loose bun, light makeup, and simple accessories. Her light blue Calvin Klein lacy heels and the small round metal Ray-Ban RB3547N sunglasses just added the cherry on the cake. The well-known television personality and top model Kendall Jenner was spotted, slaying the look in her off-shoulder Reiss Amie floral printed dress and the Vogue V052115 cat-eye glasses. Jenner carried a caramel coloured Kurt Geiger (KGL) bag and wore MissKG Lyra white sneakers, and managed to keep the look really simple with light makeup. The gorgeous American model, Bella Hadid was recently spotted sporting a cool look with a pair of blue boyfriend jeans and a low cut, white, full sleeves crop top. She spiced up the chic look with a pair of Moschino MOS 006/S yellow cat-eye glasses and a black Steve Madden Satchel. 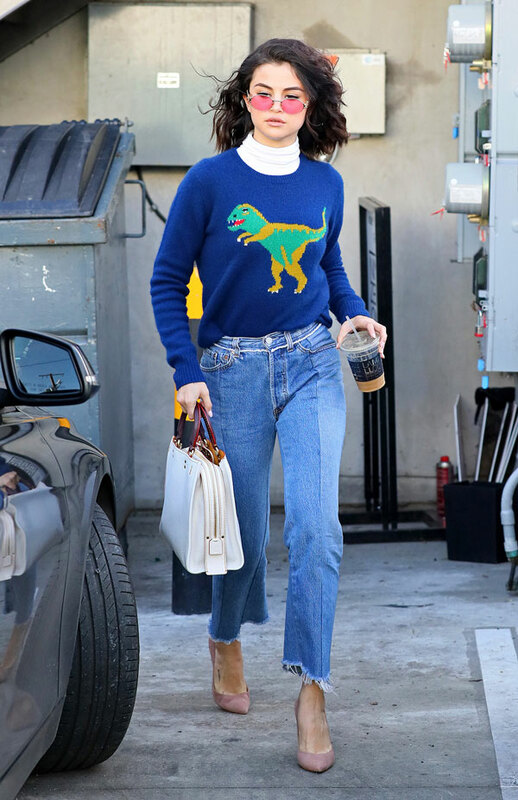 The famous young singer Selena Gomez, kept the onlookers staring as she walked the streets in her bohemian look where she wore a turtleneck dark blue sweater with a pair of loose jeans and Steve Madden stilettos. The pink Givenchy 7090S shades and her wavy open hair simply completed the unconventional look.